During the month of May I’m team-teaching a class on the philosophy and sociology of food with 13 students who do things like move chickens, plant seeds, cook greens, make garlic aioli and bake bread. We’ve been talking a lot about the process of producing your own food by having a garden or raising your own animals. Some of our students will probably end up living in the country or in the suburbs where they’ll have some room for a nice garden or maybe even a goat or chicken. But some of them will end up in cities, and that’s got me thinking about small space gardening. Now, my little town of Madison is not a city, but many of the historic houses downtown have fairly small backyards. Up until our destruction of the mimosa tree two years ago, our backyard also had very little in the way of sun for raising vegetables. Our solution has been to rent a plot in the community garden, which allows us to raise many, many tomatoes for canning. The problem with the community garden is that it’s a car ride away. Not a long car ride by any means, but it is, nonetheless, not observable out of our back window. It might be a garden in which we raise things to cook in our kitchen, but it is not really a kitchen garden. It is not a potager. Literally translated from French, potage means a soup of broth with vegetables. A potager has come to be synonymous with a vegetable garden–the place where you grow the things that will go in the vegetable soup. Unlike traditional American gardens, which are usually planted away from the house in neat little dirt rows which mimic the rest of our agriculture in the U.S., the potager is located as close to the kitchen as possible. 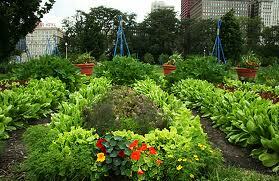 The potager is also different from American gardens in that aesthetics is equally as important as edibility. You should certainly be able to cook out of your potager, but it should also give you great pleasure to look at year round. In the United States, we tend to have a somewhat compulsive need to separate out all our uses. You see this in our insane zoning, which in the suburbs, puts houses miles away from the nearest place to buy anything. God forbid commercial and residential be in the same block. This idea becomes so ingrained in our heads that it really was weird for me when I moved to Madison to have a florist right down the street from our house. “What’s a shop doing close to my house,” I kept thinking. Maybe this need to compartmentalize is specifically a food thing. I just read in Margaret Visser’s book, Much Depends on Dinner, about the American need to eat all the parts of our dinner separately. Meat here, potatoes there, salad in a separate bowl. This is very different from some food traditions which lump everything together in one big, delicious pot. In our yards, we separate our pretty plants from the plants we eat. Edible plants in the vegetable garden with no eye to aesthetics and usually hidden somewhere out of view. Certainly you don’t put your vegetable garden in the front yard, even though for a lot of urban and semi-urban dwellers like myself, the front is the sunniest spot available. Pretty plants exist to be pretty and are prominently displayed. The potager spits on this artificial division. Or it’d probably be more accurate to say that the potager makes that dismissive “pfft” noise that seems uniquely French at the idea that plants can’t be both edible and beautiful. I checked out a score of books from the library that are all about raising food in unexpected places….on your roof, your patio, and yes, in your front yard. 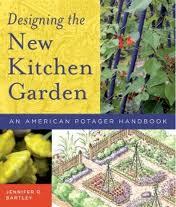 What was especially interesting about Designing the New Kitchen Garden is that Jennifer R. Bartley grounds her very useful suggestions in a fascinating history of kitchen gardens and a brief survey of some historic and contemporary potager gardens. So from this book I learned that the root of the word for paradise comes from the Persian word for a walled garden or orchard. Isn’t that lovely to think about? Medieval monks and nuns took their gardening very seriously, and the principles of the potager harken back to these early traditions. They are often laid out with paths that cross in the middle, symbolizing Christ on the cross and the four rivers flowing from the Garden of Eden. In Europe, the garden followed the archetype of the clearing in the woods, while Eastern gardens were designed to resemble an oasis in the dessert. 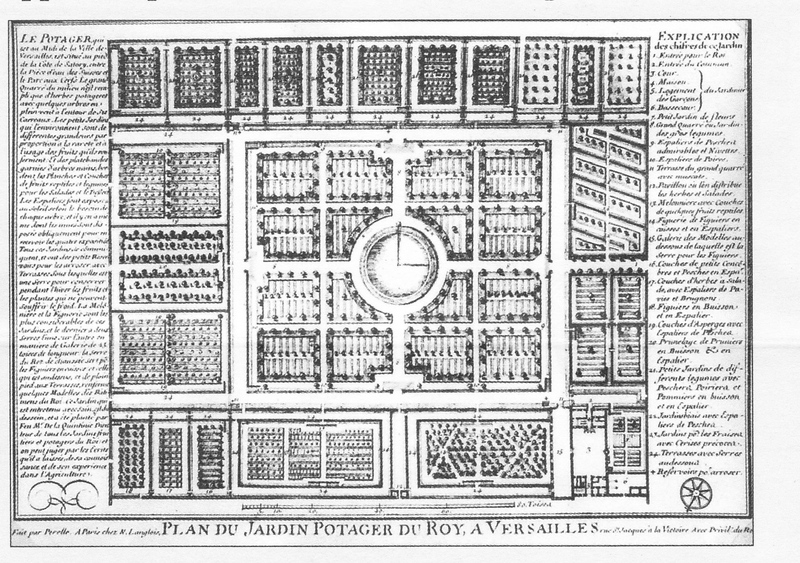 But their design was also grounded in practicality; the kitchen garden went next to the kitchen and the medicinal garden by the doctor. The poultry house would be located next to the garden for fertilizer. In many monasteries, the monks would be buried in the orchard, their bodies fertilizing the trees. Can you think of a more perfect way to participate in the natural cycle of life, death and re-birth? 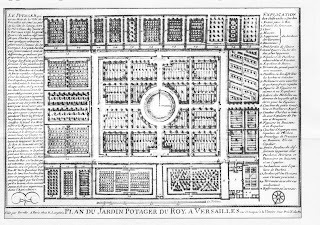 Bartley gives us lists of what would have been grown in these medieval gardens, and it’s fascinating to think about Medieval monks fighting the same battle with their spreading mint that we all fight today. In a contemporary sense, the beauty of the potager garden is so simple that I had to read this book to be reminded of it. A garden, regardless of what kind of garden it is, should be enjoyed every day. It should be something that is like a part of your house, in that it is just another room that happens not to be heated or air conditioned in quite the same way as the rest of the house. Some people stumble upon this reality by accident and some by an intuitive sense for the kinds of places that are enjoyable to spend time in outside. My parents have a beautiful deck and gazebo which are shaded almost all day long by a large oak tree and other trees they have planted over almost 40 years in their house. Because these areas are shaded all day long, they are cool enough to spend time in even during the very hottest part of the summer. This outdoor room is connected to the rest of the house through a kitchen extension with windows on three sides. These two rooms–one indoor and one outdoor–are clearly the most pleasant rooms in my parents’ house. When people visit, they exclaim over how beautiful it all is. And yet, when we build a house in a new development, the first thing that happens is we cut down all the trees. I understand completely why no one in the suburbs ever leaves their house. What would they do? They build quite pleasant and sometimes elaborate decks on the back of their houses, and they put up umbrellas sometimes. But they’re still sitting in the blazing sun because what they don’t have are trees. Who wants to spend time out there in the summer? Anyway, the potager should be designed to be an additional room, so it should be pleasant and livable and comfortable. And, yes, edible. This comes as no surprise to any of you who have tried raising any kind of growing thing yourself, but the growing of things takes some maintenance and care. Gardens work best if you can regularly check out what’s happening. Are the tomato plants wilting? Is that a potato bug? And what’s happening to the eggplant leaves, for Christ’s sake? These kind of crises are best handled on a daily basis, rather than in weekly intervals. And it’s easiest to take care of your garden daily when it is both close to you and a place where you want to be. In fact, daily maintenance of a garden can actually be enjoyable because small daily tasks seem infinitely more manageable than that moment when you walk into the garden and realize that the battle with the weeds may have been irretrievably lost in between your last two visits. This I can swear to from personal experience. Can an edible garden also be beautiful, though? Yes, I think so. It may take a small step outside of our normal gardening sensibility, but have you ever looked at the beautiful stems of rainbow chard? Or the lovely purple flowers on an eggplant, let alone the sensuous opulence of the eggplant fruit itself? All the principles that apply to flower gardening also apply to the potager. Balance colors and height. Think of your garden as a year-round endeavor rather than just a spring explosion. And there’s always the edible flower, which includes nasturtium, calendula, pansy, Johnny-jump-up, tulips, violets, daylily, hollyhock, bee balm, and rose. This book came to me at just the perfect moment. My backyard already has the beginnings of an herb garden in the flower beds with mint, sage and oregano. When I found some brussel sprout plants early this spring, the fence wasn’t yet up at our community garden plot. This meant to plant the brussel sprouts up there was to risk their being nibbled to nothing by deer. So I stuck two in the empty pots on our patio. And then I planted some cilantro seeds in a pot. And then the little basil plants I got at the farmer’s market (for a mere 50 cents a pot!). And then when I bought eggplant and peppers, I thought about how I could probably control what happened to them better down here than I could up there, so a couple of them went in pots, too. Currently I have two eggplant, a banana pepper plant, cilantro, dill, parsley, beets, rainbow chard and nasturtium all growing in various pots. My own little potager is under way and it’s quite satisfying already. And my ambitions are growing. Potager very often used raised beds, because these often take good advantage of small spaces. There are also amazing pictures of espaliered fruit trees growing in very small spaces, and so we’re contemplating an apple tree espaliered against our wooden fence. Hopefully when I check back in next year, we will have busted up the concrete sidewalk that bisects our back yard and begun building some raised beds scattered through the sunniest parts of the yard. I’m even contemplating a smaller raised bed out front, though there’s always the risk of having your vegetables stolen by the passer-bys. Needless to say, I found this book quite inspiring. Life-changing, you might even say. There are, of course, lots of pictures. Barley also breaks the potager down into some basic principles. She walks through her re-design of several spaces into potager, including a garden for a functioning restaurant. She’s clearly a convert to the idea of the potager, and I have to say that now I am, too. P.S. Okay, one more interesting tidbit from the book. She speculates that English cooking is not as–hmmm, how to say this delicately, flavorful?–because the English moved their gardens farther away from their kitchens and hid them. See how important it is to have your garden close? P.P.S. I just discovered Bartley has a blog called, American Potager. Brilliant!